From the blog of Lori Bush, At-Large member of Cary Town Council. Perhaps my early engagement learning about our government at Girl’s State is what sparked my pubic service interest. But it’s watching the process of government and seeing how few people vote, that fuels me today. As folks who know me well can tell you, I been an “active” participant in the electoral process – reminding my family, neighbors, friends and constituents about the importance of voting. There is phenomena in this country where folks just don’t seem to vote. In the 2008 Presidential election about 63% of eligible voters cast their ballots – but in local elections, that number is closer to 15%. Yes, 15%. This has always surprised me. Why would you NOT vote? I’ve heard lots of reasons for not voting from folks. “I’m too busy or, I work and can’t get there, I don’t know who’s running, My vote won’t matter… But none of these really ring true to me. Voting in this country is a right, privilege and responsibility. Throughout history, so many of our servicemen and women have given their all to protect our nation, or as Abraham Lincoln said, “their last full measure of devotion.” Voting is a right that people across the world continue to fight for and that many have not yet achieved. Voting is also a responsibility – and an opportunity. It’s your chance to choose who represents you in making the decisions that guide our society. Many elections also have social consequences, as well. Without your vote, your voice is not heard. By now you maybe thinking “C’mon, does my vote really count?” I’m here to tell you, it does. We’ve seen elections recently that were decided by just a few votes. That alone should tell you that each and every vote matters. But, your vote does more than elect candidates. It holds us, your local and national leaders responsible and accountable for the decisions we make. Your vote also sends a message about the issues that you believe are important, and have you weigh in on the topics of the day, personally providing your say about your community. So, you’ve seen the signs all around town by now. With the primary election on May 8th, the candidates are doing what they need to do to get your attention. For some folks that aren’t from North Carolina, there are some new definitions that have to be learned about voting here. If you ARE registered as an “unaffiliated voter” you are in good company with more than 30% of voters in Cary registered as “unaffiliated.”) In Wake or Chatham County you CHOOSE your ballot, either Democratic, Libertarian, Republican or Unaffiliated. That does not lock you into that party for the general election, or moving forward. Choosing a political party ballot will allow you to vote for those party candidates on the ballot, the races that are non-partisan, and the referendum of the Amendment to the NC State Constitution. If you are registered with a political party, you must use *that* ballot. Be prepared before you go, and check out your “sample ballot” online. One of the great advances in the voting process has been no-excuse absentee, also called “early voting”. Early voting is the ability to allow a qualified voter to cast his or her ballot prior to the official election day. No excuse or justification is required. You just show up! In Wake County early voting is in full swing, and you can vote this week at a location near you from 11am – 7pm, Monday thru Friday. In Cary, you can vote at the Herb Young Community Center, or check out the Wake County Early Voting page for more information. If you live in Chatham County, check out the Chatham County Election page for more information. Let’s face it, with early voting and their extended hours, there is really no excuse NOT to vote. This wouldn’t be a blog without my editorial perfunctory comments. So here goes. 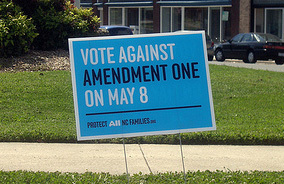 I will be voting AGAINST AMENDMENT ONE. Plain and simple: it’s bad public policy, it harms North Carolinian families and children, and it writes discrimination into our State Constitution. Furthermore, it reduces our state’s ability to successfully compete for jobs in these tough economic times while harming our business climate and having the potential to have far-reaching unintended consequences for so many. But for me, it’s more personal. As the grandchild of a Holocaust Survivor, I know too well the impact of discrimination. What Amendment One aims to do is to make some of our friends, family members and co-workers feel “less than” the rest of the population. To limit their ability to care for their loved ones and to deny them or their children health insurance, whether in a gay or straight domestic partnerships, is ludicrous. This is discrimination, plain and simple; and our state, our people, and our constitution deserves better than this. Abraham Lincoln called democracy a “government of the people, by the people and for the people.”This means that we are not here to serve our government, but that our government is here to serve us. You have the responsibility to vote – and have your say. Please make time to do so. Amendment One photo by kittenry. NOT growing up in the segregated culture of the South, I’m not one to demand that the government codify my personal prejudices. However, Amendment One is an example of the age old American struggle to protect the rights of the individual from the tyranny of the prejudices of the majority. Today, we consider ourselves to have a universal set of constitutionally protected God-given rights, that in fact, at our founding, only applied to a minority of property-owning white English males. Now, next Tuesday, NC’s citizens will decide whether to constitutionally bar some of those rights from a minority of our citizens of a differing sexual persuasion. Let us not reopen, the as yet unhealed wounds of a 150 years ago, when this nation nearly tore itself apart in a state of anarchy and self-destruction; because those who would divide us, including North Carolina, set about a rebellion to preserve their constitutionally protected God-given right to continue the practice of black slavery. We are now peacefully reunited as Country and many of our citizens have changed their prejudices but apparently some have forgotten what it took? Thank you Lori for reminding folks that we live in a democracy and think of the millions of Americans who gave their lives to keep our nation free so we can exercise our right to vote (unlike many other oppressive countries). To quote a wise woman: “When you’re involved you affect change. When you’re not involved change takes place without your participation…”. I appreciate your involvement as a public servant and I agree that Amendment One is discriminatory and denies civil rights to a significant number of North Carolina citizens. Apex Community Center is another early voting location but on Sat. is only open from 10am – 1pm and you’ll have to fight the Peakfest traffic. If you live closer to Apex, suggest early vote on Friday.